CHICAGO, ILLINOIS, 2018-Sep-13 — /Travel PR News/ — Hyatt Hotels Corporation (NYSE: H) announced today (September 12, 2018) that a Hyatt affiliate has entered into a franchise agreement with a subsidiary of Matmut S.A.M. 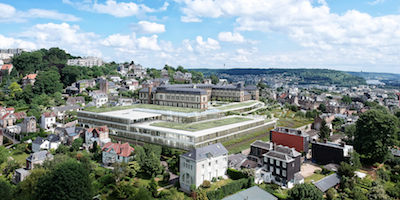 to develop the first Hyatt-branded hotel in Rouen, the capital of Normandy, France. Managed by Cycas Hospitality, Hyatt Place Rouen will be the second Hyatt Place hotel in France, and will join the dual-branded Hyatt Place and Hyatt House hotels at Paris Charles de Gaulle Airport that are currently under development. The Hyatt Place project in Rouen reflects the brand’s strong momentum in the fast-growing select service category as Hyatt Place hotels continue to expand across Europe. This entry was posted in Hotels, Luxury, Travel, Travel Services, Travelers and tagged Asli Kutlucan, FRANCE, hotel, Hyatt Hotels Corporation, Normandy, Nuno Galvao Pinto, Rouen. Bookmark the permalink.